Yeah, that's right...Life's STILL a Carnival! 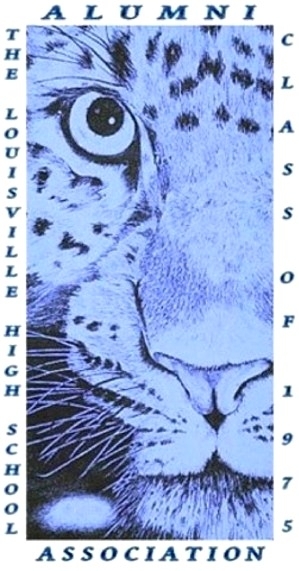 You've made it to the official website of The Louisville High School Class of 1975 Alumni Association! Back in 2011, a few of your classmates sat down to discuss some ideas for our 40th-year reunion (which, in case you missed it, was a smashing success!). One idea was to create an alumni association...partly to plan for the reunion, but also to organize our efforts to stay in touch and help each other out. Our association was established in March 2013, and our By-Laws were approved by the Charter Officers of the Executive Board in April 2013. The links along the left side of this page take you to other pages on our site and, as you’ll see, we’ve got a lot of fun and informative stuff to share with you. As usual, though, there’s a catch…if you’re not yet a member of the association, your access will be limited to this "Welcome Back" home page and the first six pages below that. However, if you want to get to "the good stuff", we suggest you start by clicking on the "Membership-Tickets" link. Once you’re there, you can whip out your credit or debit card and join the association for the low, low price of $5.00 per year...that’s less than the price of most fast-food meals, and a heck of a lot more satisfying! For the convenience-minded among us, there's also a lifetime membership option (more about that on the "Membership-Tickets" page). The association starts 2019 with our 13 lifetime members. Of those 13, four are honorarium memberships that were purchased in memory of several of our deceased classmates. We’re shooting for 50 members before the end of the year, but we can’t do it without you! Remember, as our official mascot, Louie D. Leopard, will tell you, "Leopards NEVER lose their spots!" Now seriously, are you really gonna argue with a rather ominous-looking blue leopard named Louie? Nahh, we didn't think so! Finally, before you go…if you're reading this online, why not take the plunge and join many of the rest of us on Facebook! We've got a group with over 130 of our classmates online, and we’d love to add you, too. In addition to keeping everyone updated on what the association is doing, we share news from Louisville, birthday greetings, grandbaby pics and all kinds of stuff with our old friends who are sometimes thousands of miles away. If you're unable to join the association, but still want to stay in touch with the rest of us and keep updated on what we're doing, our Facebook group is definitely your best option. The only catch is, the group is “secret”, so go to our “FAQs” page and we’ll explain how to get in. OK, on with the show! Who was voted "Outstanding Senior Guy" from our Class? What kind of reunion do you think we'll have? Wild and crazy...think Toga! Toga! Toga! Sublime and subdued...the ultimate in suave sophistication! The awkward, icky kind...you know, like when everybody's sweaty and won't look at each other...ewww! I don't have to think about it, I know the Reunion Committee's going to make this the best reunion ever!